In the event of a demonic attack, seeking out a church or monastery would be wise... in most cases. However, if the demon Valek is your supernatural assailant, no amount of rosaries, crosses or religious sanctuaries can offer any real protection. Only your two legs can save you so start running as fast as you can. The truth is, Valek isn't like most demonic spirits. This evil entity possesses an extra dose of wickedness, enabling her to take the guise of a devout nun, complete with a tunic and habit. Patrolling the monastery halls at all hours of the night, this demon is able to blend in with the holiest of people, which is a horrifying reality and perhaps, her scariest quality; her razor-sharp teeth are a close second though. 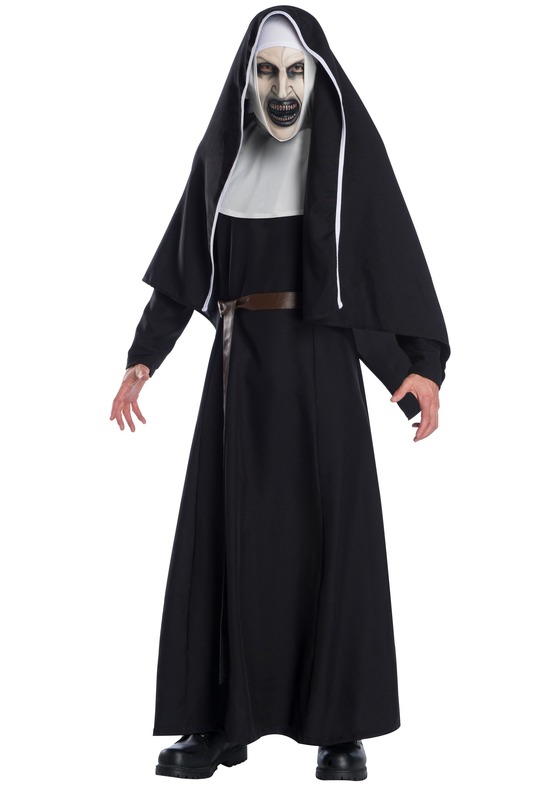 If conjuring the evilest costume in existence piques your interest, dressing as Valek in the form of a nun is a prime choice. Straight out of the Conjuring universe, this costume accurately depicts the murderous succubus from the film, instilling fear into anyone who dares to look. The officially licensed adult deluxe The Nun costume comes with everything necessary to achieve the petrifying look. The dress features a full zipper in the back and gets topped off by the white, rounded collar which has a hook & loop fastener on a fabric neckband. A metal buckle belt cinches around the waist while the veil tops of the look. The veil has an attached inner hood so it stays on the head comfortably. Finally, there's the most terrifying part of the ensemble: the mask. The plastic mask has an attached elastic band in band and foam padding on the inside for comfort and positioning. The mask is artfully created to look like the possessed Nun. Although this costume comes with everything needed, wear an ornate cross pendant around the neck to enhance this frightening costume.